How Secure Is Valerie Jarrett’s Position in the Obama Administration? Immediately following crushing defeat in the 2014 referendum over Barack Obama’s anti-capitalist policies, calls mounted in Democrat circles for ouster of senior advisor Valerie Bowman Jarrett. At first, Jarrett survived stiff challenges–could this year prove different? America’s overleveraged, deficit-wracked economy is buckling, as we fail adequately to identify and then defeat a growing raft of foes–somebody senior seems certain to pay the price. Enemies and rivals understand what Team Obama refuses to appreciate–America’s power, targeted properly, is a force for good that we cannot project forever from an overstretched financial position. Though many insist otherwise, America’s finances actually are more crimped now than when the global structural crisis started to bite back in 2008. Most American workers are worse off, as data produced by the Obama Administration makes plain. Every slice of the working population earned and saved less in 2013 than it did in 2008. Meanwhile, according to the Federal Reserve System, America’s total debts are higher than ever before–$58 trillion on September 30, 2014 compared to $52.5 trillion on December 31, 2008. Americans know we cannot service soaring debts with dwindling after tax incomes. We certainly cannot also defeat foreign enemies who rise as America sloppily and errantly retreats. Fomenting regime change is dangerous business–yet, whoever has the last word on President Obama’s foreign policy is wholeheartedly in favor of meddling numerous places, outside Congressional and public oversight. In the wreckage across Libya, Egypt, Syria, and Yemen (to pick just four places where the Obama Administration interfered), who finds clear signs that America’s lasting national interests were advanced? Why did the Obama Administration incite regime change so many places yet refuse to do so in Iran starting in 2009? Who bears responsibility for imminent dangers posed by the subsequent rise of Iran, especially if that foe with a long memory succeeds in upending the supposedly ordered succession now underway inside Saudi Arabia? Letting Iran step into the vacuum created by America’s unwise and hasty exits from Iraq and Afghanistan is another epic failure. Now, Iran spreads its influence across the Middle East, gloats publicly about its successes humbling America, all the while continuing with bellicose statements against our long-standing ally Israel. Meanwhile, Russia is close to tearing apart the European Union and the North American Treaty Organization. Weakened certainly by U.S.-led sanctions, Russia’s financial position is not as stretched as America’s. Expect Russia to push hard and attempt to woo peripheral European states and even Germany away from America’s orbit. Who ultimately pays for Team Obama’s failures? For six years, America has been ruled by a small clique who adroitly bypassed Constitutional checks and balances, while also rendering the mainstream press impotent. No official seems to hold more power over Barack Obama than Ms. Jarrett–someone who never has been fully vetted by investigative journalists and by America’s national security apparatus. Never in America’s history has power been concentrated in the hands of two people less qualified or prepared to lead the free world. And, never have those who might restore America’s tripartite government into balance, proven so deflated and so impotent. 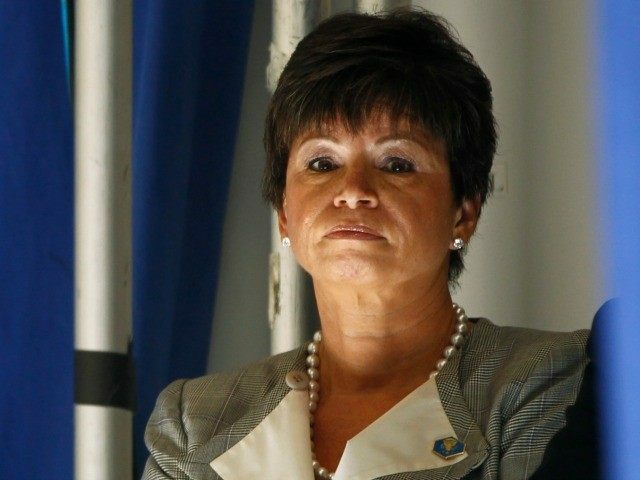 Intense analysis of Valerie Jarrett’s background, her colleagues, her patrons and beneficiaries of her largesse will not come primarily from inside America; instead, security services and journalists in nations now threatened by Jarrett-Obama foreign and economic policies will finally do what we evidently will not do inside America for ourselves. Valerie Jarrett, Barack Obama, and others who dominate America’s Executive Branch soon will learn hard lessons in global power politics. Get set for a year in which elections definitely will have far-reaching consequences.